Planck's latest map of the full sky shows higher (red) and lower (blue) concentrations of interstellar dust. In the region of the southern galactic hemisphere studied by the BICEP2 telescope (box on right), there were sufficiently high concentrations of dust to account for BICEP2's gravitational-wave signal. (Inside Science) -- "Extraordinary claims require extraordinary evidence." This phrase, popularized by the late Carl Sagan, kept going through my head on March 17, the day that researchers involved with BICEP2, a telescope in Antarctica, made a big announcement at the Harvard-Smithsonian Center for Astrophysics in Cambridge, Massachusetts. The researchers reported that BICEP2 detected gravitational waves from the first moments after the big bang, a feat, which if confirmed, would open up a new field of study and would surely be recognized in a future Nobel Prize. Gravitational waves are ripples in space and time. They're created when any object with mass accelerates. However, they're extremely weak, making them very hard to detect directly. Even for the most massive and cataclysmic events, such as the collision of two black holes, their effects, observed from Earth, are very hard to detect. If you're looking for a detectable gravitational wave signal, what bigger event can there be than cosmic inflation? According to inflation theory, the universe multiplied its size by as much as 10 trillion trillion trillion times in the first fractions of a second after the big bang. Inflation would have generated lots of gravitational waves. In turn, gravitational waves can subtly change the properties of light that they pass through. Specifically, they can slightly affect the polarization of light, the direction in which light's electric fields vibrate. The universe's rapid expansion during inflation would have amplified the waves' imprint on the early light in the universe. The state-of-the-art BICEP2 experiment, which uses super-sensitive superconducting sensors, could detect tiny changes in polarization in the cosmic microwave background, the very first light released in the universe, which is still reaching us today. The BICEP2 researchers reported a very high polarization signal, known as B-mode polarization after its characteristics, in the cosmic microwave background, which they interpreted as a strong gravitational wave signal in the early universe. Detecting this polarization signal was a striking result, announced in a series of scientific talks and a press conference shortly after a preprint of the paper was posted online. Notice these last two points: announced at a press conference, and a preprint posted online. A preprint is a written paper that has not been formally reviewed by independent peers or published in a scientific journal. Nonetheless, scientists and reporters alike reported excitement over the results. If true, they would provide the greatest experimental support yet of cosmic inflation, and the first direct detection of gravitational waves. Previously, gravitational waves have been detected indirectly, such as in observations of pairs of stars falling towards each other: they were losing energy in the form of gravitational waves. On the day of the BICEP2 announcement, and for many days afterward, people were largely accepting the results as correct and already jumping to the implications of the BICEP2 results for what appeared to be a new era of gravitational-wave cosmology. "Given the importance of this result, my starting point is to be skeptical. Most importantly, there are several independent experimental groups that will test this result in the next year." Spergel explained that the new gravitational wave measurements did not appear to agree with those of previous experiments, known as WMAP and Planck, unless the simplest models of inflation were replaced by more complicated ones. On the first day and week of coverage, I became very disappointed with the many commentators who disregarded or underemphasized the earlier measurements from instruments on WMAP and Planck, which had been reported and covered for years. Sure enough, in the weeks that followed, other researchers pointed out that the signal that BICEP2 detected may have been attributable to the polarization of light caused by dust in our galaxy. The BICEP2 team certainly knew that dust could also polarize light in a similar way to gravitational waves, but they used a model, based on the data that was available from the Planck satellite, that, the other researchers pointed out, may have underestimated the amount of dust in the part of the sky they were studying. The BICEP2 paper underwent peer review and was published in Physical Review Letters. As a result of the peer-review process, the researchers made revisions, including removing the model that contained the lower estimates of dust based on the earlier Planck data, and thereby reducing the certainty with which they could state that they accounted for signals from interstellar dust. During the summer, the BICEP2 and Planck collaborations agreed to work together to analyze their data, to help determine if gravitational waves had really been detected. This week, the Planck team issued a preprint, based on an analysis of much additional data, showing a comprehensive map of dust in the sky. 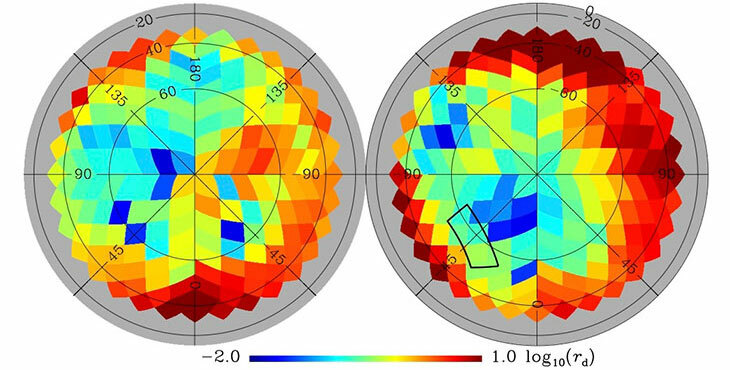 According to their analysis, the signal in the part of sky that BICEP2 analyzed could be completely attributable to dust and not to gravitational waves. But, the story is not over. For starters, keep in mind the new preprint, like all newly posted publications, still needs to undergo formal peer review. And the latest data do not completely rule out the possibility that the BICEP2 group detected a gravitational wave signal. If the evidence holds up at all, it would likely be a weaker signal, after accounting for the dust. Or, the gravitational-wave signal may completely turn to dust. It may be possible to detect primordial gravitational waves in a different, less dusty part of the sky, or with new measurements by BICEP2, Planck or the many other experiments that are looking for them. Just as the first reported detections of exoplanets turned out to be false, perhaps this is a prelude to an actual detection of gravitational waves. The Washington Post's Joel Achenbach provides a roundup of reactions to this latest development. For Nature, Ron Cowen explains the new results and gets reactions as well. "You cannot ignore dust," he quotes from Planck scientist Charles Lawrence of NASA’s Jet Propulsion Laboratory in Pasadena, California. The biggest lesson, to me, is that no one should rush to make announcements and pronouncements, whether big or small, even in the face of intense competition and the alluring prospects of launching a new field of study and winning a Nobel Prize. Scientists, and the rest of the public, should follow the time-tested scientific practice of subjecting claims to sufficient levels of scrutiny, and waiting for other groups to validate results, before making bold statements. At the very least, there have been major caveats and qualifiers in announcing new data with potentially huge implications.